the potential of your sales. Online booking engine allows clients to quickly book their desired rooms and services and to receive a booking confirmation in their preferred form. Displays live real-time information on available rooms, rates, prices, and special offers. Immediately informs clients on prices of their selected rooms and services. Allows clients to see offers on specific selected dates as well as flexible dates basis. Provides opportunities to form special offers based on the duration of stay. When no rooms are available for the selected dates, MaxiBooking booking engine will automatically offer rooms on the nearest available dates. Online world has become an integral part of a daily life. It broadens the scale of available services, offers new technologies and provides constant new business opportunities. 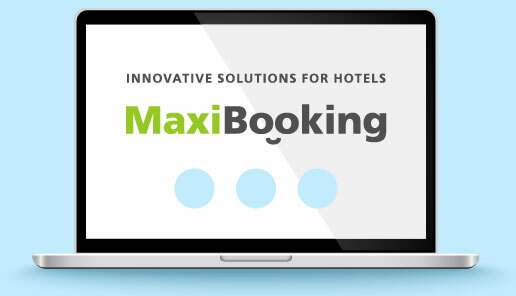 With online booking engine clients can now book a hotel in a matter of seconds. Our booking engine is suitable for all types of hotels, holiday resorts, individual properties, hostels, and any other properties that offer accommodation. Online booking engine integrates in the hotel’s website easily adapting to its parameters. You control all the access rights to the system and manage the hotel’s occupancy by constantly receiving live real-time information about reserved and available rooms, prices and rates. After installation of the online booking engine on your website it will not only display real-time information about your hotel, but also proactively help you in business parameters. registration of clients contact details. receive information on current available offers and prices in your hotel. select, book and pay for the selected room and services online. online booking is available 24/7 reducing personnel costs. engine prevents overbooking by eliminating possibilities of employee’s input mistakes. Online booking form is convenient for hotels and their clients. Engine effectively performs its functions converting website visitors into clients, expanding clients base, and increasing your income. With MaxiBooking you can offer you clients any payment option and required prepayment percentage that are convenient to you.